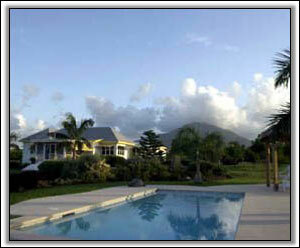 This West Indies-style house and guest cottage are on 8 secluded acres on a delightful beach in an out-of-the-way corner of Nevis. Both houses are freshly painted and beautifully redecorated. The high vaulted ceilings and traditional wooden awnings maximize the cooling effect of the ocean breezes coming over the mountains behind you. 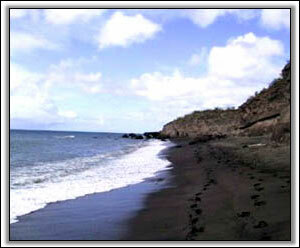 A stairway takes you to a little black sand beach which nestles within the property. If you enjoy peace and quiet in stunning natural surroundings, this unique home may be right for you. Here you'll find the real charm of the West Indies. 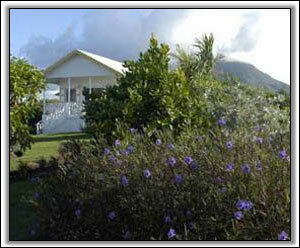 The house has a brand-new kitchen, a large screened porch facing the Caribbean, a patio looking out to the volcano and other hills, and a swimming pool. Our beautiful and innovative new gardens using native species are designed by British award-winner Julie Toll. Local art work complements the lovely color scheme. There are 2 bedrooms, a sleeping porch, and 3 baths plus a sofa-bed in the living room, as well as complete laundry facilities. A convenient built-in computer desk with Internet access will provide you with an expansive view of the sea while you log on. 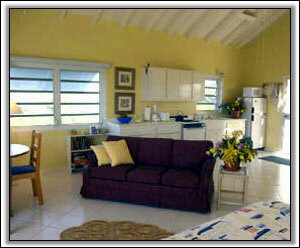 The cottage easily accommodates a couple, or parents with a child. 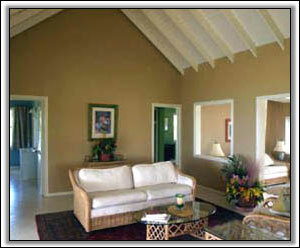 It has a queen size bed and a sofa-bed, as well as complete kitchen and dining facilities, all within one room. 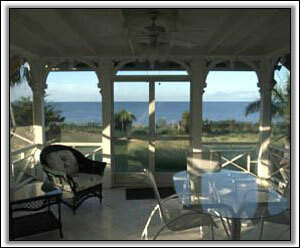 There is a patio in back looking onto the volcano, and a porch in front giving a 180-degree view of the sea. The cottage has a hot tub set in beautiful new gardens. A closet off the patio houses the washing machine. If you travel with a laptop, you can use the dial-up Internet access.